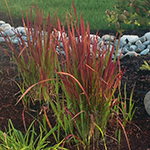 Japanese Blood Grass is a popular ornamental grass. It is known for the deep red hues that develop in the latter part of the summer and carry into the fall. Japanese blood grass will typically stand 1-2 feet tall and grow in clumps 2 feet in diameter. This makes an excellent accent in the garden. Japanese Blood Grass grows well in full sun and will also do well in partial shade. It does take a good exposure to the sun to develop the characteristic blood red color each summer. It prefers moist to wet soil that drains quickly. Imperata cylindrical will typically die back in late fall or early winter. As part of your winter maintenance, trim away the dead grass on each clump to a height of 2-3 inches. Trimming too short can damage the crown that will sprout new growth next spring. Plant the Blood Grass clumps no closer than 2 feet apart. Japanese Blood grass will continue to spread by sending out lateral runners that are just 1-2 inches below the soil surface. You can contain a clump by placing a 6 inch deep barrier around a clump. This grass also grows well in containers or large wooden barrels. Japanese Blood Grass does not need to be fertilized. Not sure why I see Japanese blood grass less often these days. It could be because some of the first homes to get it did not use a root barrier and the plant got a reputation that spread faster than it could spread. Most of the better looking plantings I encounter though in Portland metro landscaping, seem to be those in barrels. Most I see in beds have not been maintained to conform to an aesthetic shaped planting. I’ve only seen a handful that have really sprawled way out of control and invaded shrubs or other ground covers.